Time: 1 hr. 30 mins. The Arch Loop is located in the Utah Rims Area near the Colorado/Utah border west of Grand Junction, Colorado. The trail takes a roundabout route across hillsides and through several washes passing along the way a natural arch that spans the head of a small canyon. The Arch Loop is the easiest trail to hike in the Utah Rims because of its relative short distance compared to the other trails in the area. 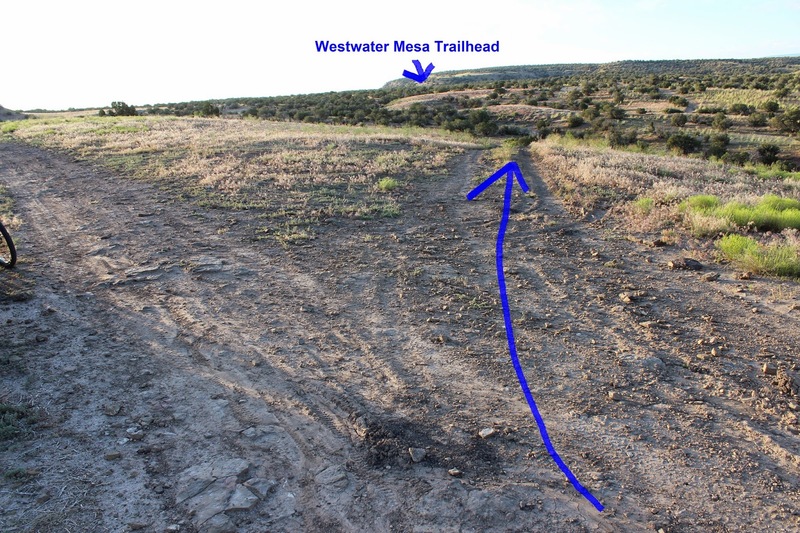 This post begins at the Westwater Mesa trailhead. To get there take Exit 227 on Interstate 70 and follow the paved road south for 3.5 miles. At that point the Kokopelli Trail makes a junction with the paved road. Turn left, continue past the kiosk in this picture, and drive 0.9 miles where another road departs on the right. This is is about as far as a passenger car can probably go if the road is in optimum conditions. It would be better for most cars to park near the kiosk and add an extra 3.4 miles to the round trip distance. From the fork at 0.9 miles it is another 8 tenths of a mile to the trailhead. There are a few spots that are a little rocky and one that requires more clearance than most passenger cars will have. In anything other than the best of conditions a 4-wheel drive may be needed to cross the washes and make it back up the hill to this point. If you happen to be on a mountain bike it is a quick ride to the trailhead. It might even be faster than a vehicle is anyway. The Arch Loop, Overlook Trail, Western Rim Cutoff and Westwater Mesa Loop all come together at this location. The Arch Loop begins on the west side of the intersection. The Arch Loop has a playground feel to it with lots of curves and hills to race over for dirt bikes and mountain bikes. Several narrow washes add to the fun. As the trail loops around toward the south there is another trail that breaks off on the right. Be sure to go straight at this point and don't take the side trail. It is not part of the loop. We believe it leads back to the pavement but we aren't entirely sure. The next set of washes have a sandier bottom but they are still ridable for mountain bikes. A couple of the hills are too steep for anything but a dirt bike to manage. The arch comes up at about the 2 mile point although as the crow flies it is a little less than a half mile from the trailhead. This is a fun place to explore and hang out for awhile. It is pretty easy to find a spot to scramble down to get below the arch. From the arch the trail continues for another half mile to where it comes to an end. 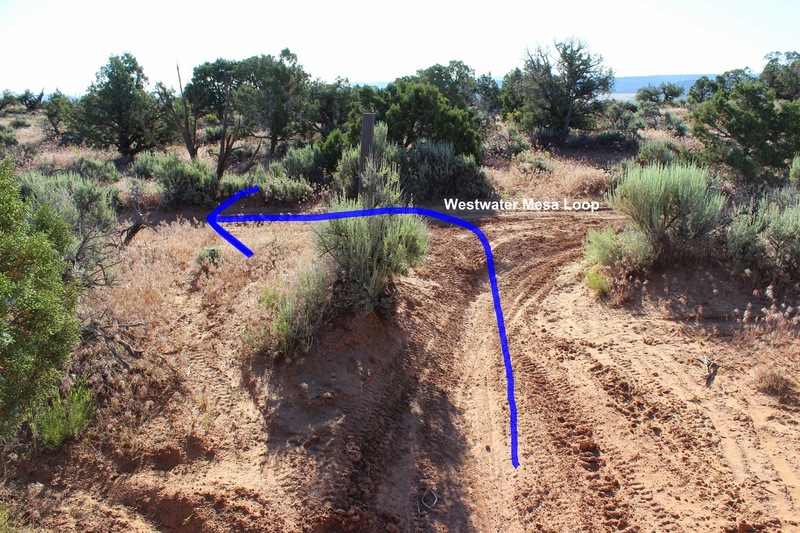 A branch of the Westwater Mesa Loop provides the route for the last mile back to the trailhead. The Arch Loop would be a good family hike for those that have a vehicle that can make it to the trailhead, and of course, family members that can handle a moderately difficult hike of this distance. Gnats can be expected at times and remember, there is absolutely NO WATER on any of the trails in the Utah Rims Area. If you would like to see it for yourself then all you have to do is grab your bike or 'Take a hike'.